Other than that, it’s completely different. I always bring up Amish fireplaces. If you’ve ever picked up a newspaper, you’ve seen it: a headline touting a miracle fireplace built by the Amish, featuring a picture of Amish guys crowded around the product. Sometimes the fireplaces are being given away for free, or at drastically reduced prices. The story layout looks like a newspaper or magazine story, although the columns, fonts, and verbiage can be wildly different than other articles. Of course, the all caps “ADVERTISEMENT” printed across the top is a tip off, too. Where advertorial is used to sell, sponsored content is used to inform. While an advertorial might try to sell space-age hearing aids, sponsored content will discuss advances in the industry. It can be a fun exercise: an advertorial sells get-rich-quick real estate seminars, sponsored content can discuss the differences between fixed and adjustable mortgage rates. Pick an industry and try to do the same. Or maybe that’s just me. So why use sponsored content if we aren’t going to talk about how great the sponsor is? By presenting the sponsor as an expert in the field. With an informed column, working with information and quotes from the sponsor and other research, we present the sponsor as an experienced and knowledgeable specialist. However, we do wander as close to the editorial/advertising line as we can when it comes to laying out a sponsored content article. 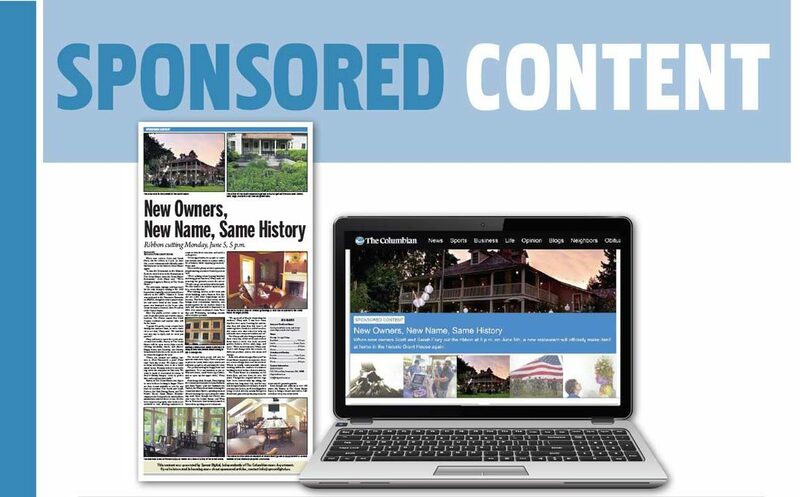 Page layout was one of the things discussed between the newsroom and advertising departments when the decision was made to implement sponsored content. Eventually, we found our solution. A blue bar extends along the top of the article, with a SPONSORED CONTENT label. Instead of a byline, we used “Sponsored by” and the name of the client. At the end of the story, we include a shaded area with more information about the client. Finally, across the bottom of the article, we explicitly state how the article was generated in Sprout Digital, apart from The Columbian news department. Online, all of those signifiers are there as well. About five years ago, Sponsored Content began dotting the publishing landscape as a new way to make revenue. Presented as something with more weight than advertorial, it gave advertisers a chance to present themselves with something other than an ad. Over the years, there have been well-thought out presentations and others that… weren’t as well thought out. At Sprout Digital, we took the best of what the limited history had to offer, cut away the bad, and found what we think is a solid investment for not only the advertiser, but the reader as well.